Mayweather-McGregor If It Happen’s It Must Be an Exhibition! On March 20, 2016 the former 3 division world champion Roy Jones, Jr., 63-9 (46), was permitted to fight Vyron “Cannon” Phillips who was making his debut as an opponent. Phillips had 6 amateur bouts. Phillips was 33 years old and Jones 46. Jones who has dual citizenship in Russia was coming off his second knockout defeat in 3 fights in that country when a contest was held and Phillips came up the “winner” but not for long. It took place at the Celebrity Theater in Phoenix, AZ, approved by the weak minded AZ Boxing Commission. It took Jones just 5½ minutes before referee Wes Melton stopped the mismatch. 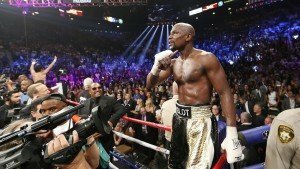 If any boxing commission approves of a Floyd Mayweather, Jr., 49-0, of Las Vegas, NV, and Conor McGregor, 0-0, of Dublin, IRE, boxing match the ABC Boxing Commission should drop that state from participating in any world title fights or something worse. McGregor was given a boxing license on November 30, 2016, by the California Commission. Several boxers have offered to fight McGregor who hasn’t accepted any of these offers. McGregor hasn’t fought as a boxer since he was the All-Ireland boxing champion at the youth level. McGregor started in MMA at age 12 and in March of 2008 at the age of 18 became a professional and has a 21-3 record with losses in 2008, 2010 and 2016. In April of 2013 he started fighting in the UFC. His last loss was avenged 5 months later in August of 2016 and followed by his last match in November in the UFC. He was the UFC featherweight and the current UFC lightweight champion. His highest weight is 154. For the sake of boxing let’s hope Mayweather decides not to take this bout against an amateur with no professional boxing experience!